I did visit the machine shop on Friday to drop off material and discuss the CNC project, however timing was such that during the one slice of time I've been able to get out of work scheduling was not conducive to actual milling. I only bring this up since, while I was there I absentmindedly left my camera behind.. as most of the weekend has been spent so far in horde mitigation this is no great loss. 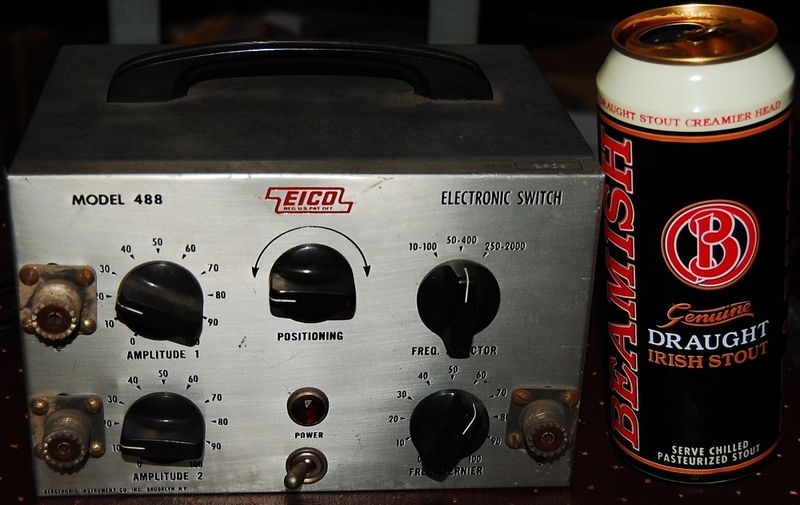 Seeing as how it was photographed earlier this month, we'll have a quick look at the EICO 488 electronic switch Dan (my magnanimous uncle) picked up in is travels. ..which appears to have been a much nicer place to live than my first 488, seen here posing with a can of beer for scale. 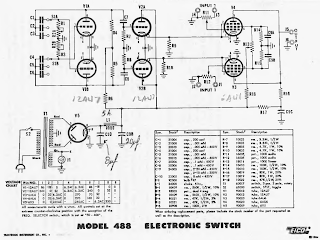 Essentially, the electronic switch was a budget driven solution to a dual trace oscilloscope. At the output on lower right alternates signal from the two inputs at left, the center "Positioning" control defines a baseline DC offset between the two input channels, so when viewed on an o-scope the two signals could be be distinctly separated on the Y axis. The two rightmost controls define range and speed of switching. The 5852 seen here (as found) is sitting in for a 6X5 (as published per schematic). 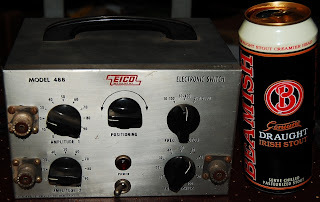 The 5852 has a higher filament draw, which concerns me as I have experienced power transformer failure in the EICO HF-81 (which was notoriously under designed) and this has established a tip-toe level of respect for EICO power transformers (that should read "power transformers in general"). That cap is an add (as found), and while this unit is the third 488 I've had the pleasure of meeting, it is the first that already had that cap in place. Observe the schematic above care of BAMA. At upper right is the oscillator section that drives one channel into conduction while clamping the other (bias modulation driven by the second 12AU7 tied to the cathode/suppressor of the following 6AU6s), C1-6 define the ranges. In my "modified" unit I've replaced C1, 2, & 3 with values that do not match the counterparts of C4, 5, & 6 providing a lope to the signal, but I digress.. 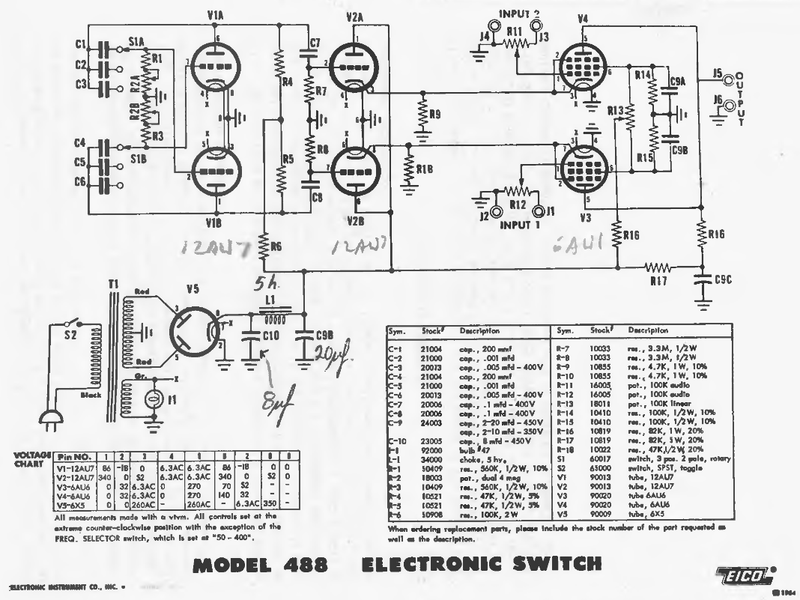 According to the schematic, illustrated at upper right, the plates of both 6AU6 are unified at B+ and tied directly to the signal leg of the 488 output. This equates to 270 volts DC at the positive output leg in a stock & unmodified unit! The blocking cap is crucial here, and I was delighted to see it in place. The EICO 488 is a fine example of why I observe and measure old equipment prior to deployment into the studio. The unit itself can output some semblance of a square wave with the positioning control adjusted to offset DC baseline between the channels, but the fun occurs while feeding it audio as well. There remains switching noise which I have an idea on but have yet to implement.